Wikileaks founder and publisher Julian Assange pictured sometime earlier in the Ecuadorian Embassy in London and prior to his arrest by London police on April 11, 2019. 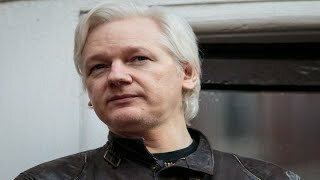 By now most people have seen the video of Wikileaks founder and publisher Julian Assange being forcibly dragged from the Ecuadorian Embassy in London by British police. Let's not mince words. This is a travesty of injustice instigated by "official" Washington because Assange published accounts of Washington's wrongdoing, embarrassed the machinations of its ruling elite bringing their vendetta against him. Let's also point a big accusatory finger at the US corporate MSM for their abandonment of Assange as a journalist after they-particularly the New York Times-initially published Wikileaks revelations of Washington's wrongdoing but now abandons him for something they do all the time, publish revelations of the governments malfeasance when it suits them. Their behavior reveals they don't give a wit about the 1st Amendment's freedom of the press. Use it only when the government-now Trump- attacks them specifically. The US empire brings its own particular brand of mayhem-initiating illegal wars, occupations, torture, extraordinary rendition, killing innocents, et al to all corners of the world-doing it all with impunity knowing the US corporate MSM is its enabling supportive partner concurring with the government's demonization and creation of "enemies" to justify its actions, knowing its leaders won't be held accountable for authorizing it all. But expose the wrongdoing as Assange, Manning, Snowden have done and they're hounded, branded as traitors, locked up (Manning), forced into exile (Snowden) and now dragged off in chains (Assange), who all revealed Washington's criminality. It's a sad day in America. How can one feel anything but distress at the prospect of Assange being jailed and almost certainly extradited to the US. And yet to this observer there seems little distress on the part of the public to Assange's plight. It's sort of eerily odd really, yet unsurprising. Which makes it all the more sad.